FYI we will NOT be meeting in Jamestown on June 30, 2018. We will be meeting at a club hunt. Please check your email if you are a paid member for 2018 for further details. Remember to bring headphones and water! Bug spray is recommended as well. We should return to our Jamestown location for July's meeting. Due to the holiday weekend, we did not hold our March meeting on March 31st. Our March meeting will be held on April 7th, at 9 AM at the Mendenhall Plantation. We will still be meeting on Saturday, April 28th at 9 AM at Mendenhall Plantation. This will be our LAST meeting until our annual seeded hunt on June 9th, 2018. Potential group hunt on a historical property this fall! Our annual June seeded hunt! Please feel free to come out and join our meetings if you are interested in metal detecting or have been swinging a detector for years. We are welcome to all to join and participate. We do require full membership in the club to participate in group hunts and our annual June seeded hunt. Come out and see what we're all about! 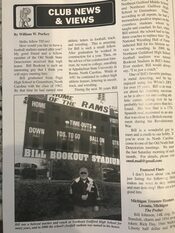 One of our members, Bill Bookout, was recently profiled by William Purkey in his bi-monthly column in Western & Eastern Treasures! Thanks to William for the shout out to our club and for sharing Bill's story. In addition, we received a very kind letter from local shop owner Jerry Barbee regarding the article as well. I am a subscriber to Western & Eastern Treasure magazine. 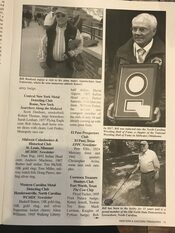 I look forward to receiving it each month and especially my latest issue which contained the article about Bill Bookout by William Purkey. I’ve known Bill for years and I enjoyed the article so much that I’m keeping the magazine in a special place to show my customers . To me Bill is as likeable, kind and friendly person as I’ve ever met and I’m proud to inform people that I know him personally, as well as William Purkey. I am continuing to give the club cards to my customers in hopes that membership will continue to increase. I thank the club for educating the public on the art of metal detecting and the Code Of Ethics which should be used in order to keep metal detecting solvent. Thanks to Jerry for such kind words and all his support over the years for the club. We hope your customers will join us too! Our next meeting will take place on February 24th, 2018 at the Mendenhall Plantation in Jamestown, NC, starting at 9 AM. Our own Robert Underwood will be speaking about adding wireless headphone functionality to your detector. A new year means new meetings! Please plan to come to our first meeting of 2018 on January 27, 2018 at 9 AM at the Mendenhall Plantation in Jamestown, NC. Membership dues for 2018 will be due at this meeting. Elections will be held for 2018 offices. Do you have a question or comment about this website or content? we welcome you to come as a guest to our next meeting. Our regular club meetings are held on the last Saturday of the month. 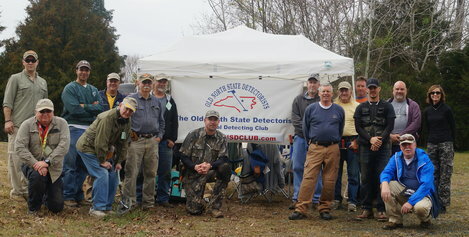 Occasionally, a club meeting will be held in the field at a hunt site prior to the start time. Guests are welcome to attend the meetings and observe the hunts, but must be a current club member to participate.